The Music College Major: Which Degree is Best for You? There are a few types of college degrees available to music majors. When looking for the right music degree program and making career decisions, it is important to know the difference. If you have a young musician on the college tour circuit, they are going to be checking out music conservatories and music schools on college campuses. Along the way, you have likely run into the BA, BM, and BS conundrum. Some schools offer a bachelor of arts degrees in music, others do it as a bachelor of music. Still others offer a bachelor of science degree while some will even offer all three. What's the difference? Each of these degrees will vary from one school to the next. The degree programs available will have different philosophies as well as course and credit requirements. It is important to look at the requirements of a specific university or conservatory. 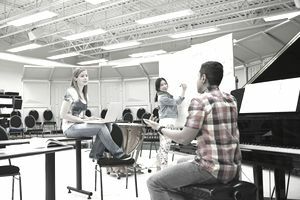 Bachelor of Music (BM) degree at a university is more similar to the depth and rigor required by a conservatory. Bachelor of Arts (BA) is a liberal arts degree with a concentration in music. Bachelor of Science (BS) degrees can lean in different directions, depending on the school. At San Francisco State, for example, a student's course load for a bachelor of music degree must include 73 units of music coursework. This includes stringent requirements for music theory, music history, and performance classes. Only 50 units are required for a bachelor of arts. These 50 units will not translate to 10 or 12 classes, by the way. Music departments are notorious for bestowing very few units per class. Orchestra, for example, may be a single unit. Lawrence University in Appleton, Wisconsin is one of the schools on Loren Pope's "40 Colleges That Change Lives" list. Their bachelor of music is considered a "professional degree," and music classes account for a minimum 144 out of the 216 units necessary to graduate. At NYU's top-ranked Steinhardt School, a bachelor of music entails more music theory, music history, aural comprehension, and keyboard classes than a bachelor of arts degree. It is worth noting that out of the 128 units needed to graduate with a bachelor of music in vocal performance, for example, 80 units are required music courses. Students will also need to take 48 different classes to earn those 80 credits. What About a Bachelor of Science? Some schools offer a bachelor of science in music degree. This is a professional major aimed at career paths in music publishing, software and/or music technology. Temple University's Boyer College of Music in Philadelphia is a perfect example. By contrast, at Indiana University, a bachelor of science in music includes a secondary emphasis in another field. This could be music technology, jazz studies, composition, or even a focus unrelated to music. What are the Five Top Music Schools in the Midwest?